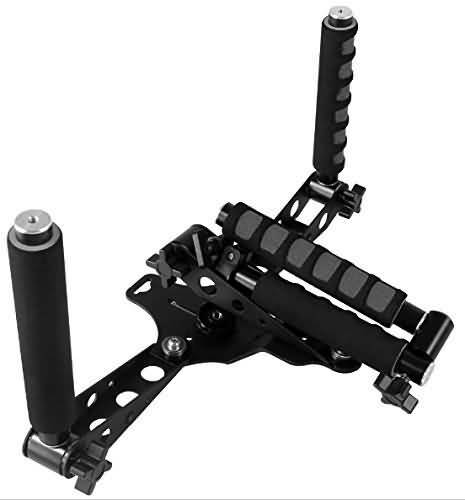 From last few months, DSLR Shoulder rig has become one of the most demanded camera accessory in the market. As latest DSLR cameras come with lightweight designs so filmmakers and other professional shooters prefer to carry them for field recordings. Shoulder Rig is an important accessory for DSLR users as it allows them to move freely while recording awesome views in the nature. Presently, you will find so many designs of Shoulder Rigs in the market as all brands are launching feature rich collections these days; so selection of right one can be a difficult task. The article below contains details about top ten DSLR camera rigs that have all great features. Keep reading the details below and choose any one of these as per your personal needs. If you are planning to buy a new 4K DSLR rig then it is necessary to check few major specifications. Pick a device that is designed with high quality materials and offer higher durability. Rig with ergonomic hand grips and shoulder pads are much handy whereas counterbalances manage gear weight properly. Try to choose the one that has a rail mount or base plate because it can easily accommodate your camera as well as other useful accessories. It is also essential to check for quick release system that offers easy accessibility with higher security. You can find rigs with variable price ranges; they fall in cheap, mid range and high end category with variable features. Naturally, if you invest more, you will avail improved service with proper grips, motorised assist mechanism and accessible controls. Price point ensure extension in service life and it also improved stability for shoots. 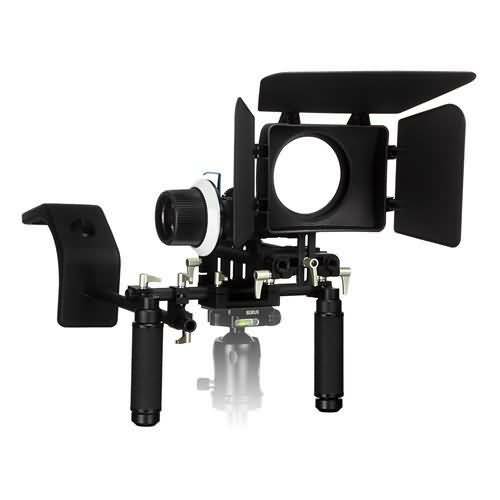 It comes with a shoulder pad and baseplate where performance is increased with mounted follow focus, perfect handgrip, 3 well curved support arms and advanced lens support. It offers compatibility for most of DSLR devices, video camcorders and the large camera units. They offer great flexibility in handling and the custom rolling case allows better space for all components. This lightweight DSLR rig offers perfect compatibility to DSLR cameras and mid-sized or small camcorders. These rigs help in easy camera positioning with effortless adjustments at eye level. 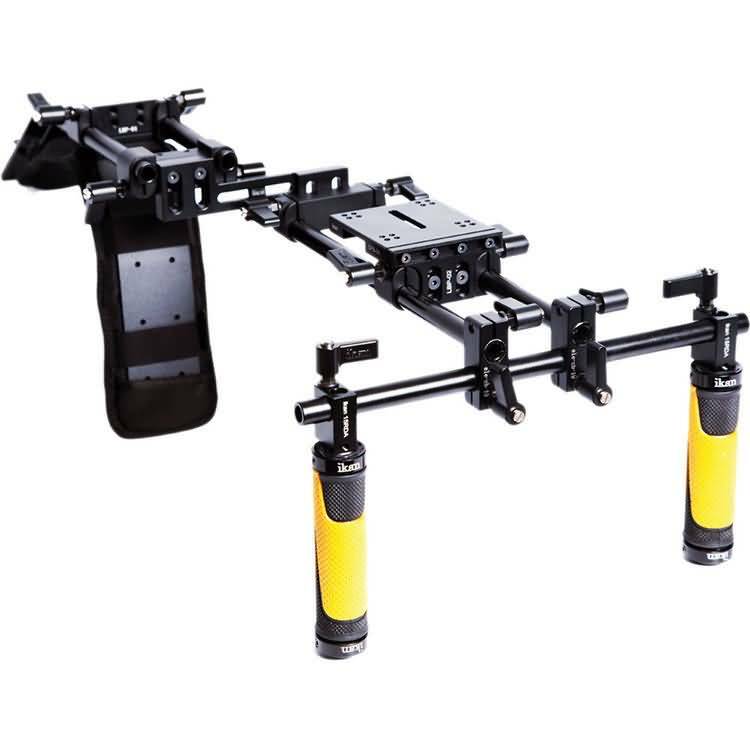 The kit includes foam grip handles to make it handy, movable arms for easy adjustments, base plate as well as offset piece that assists in better positioning at eye level. 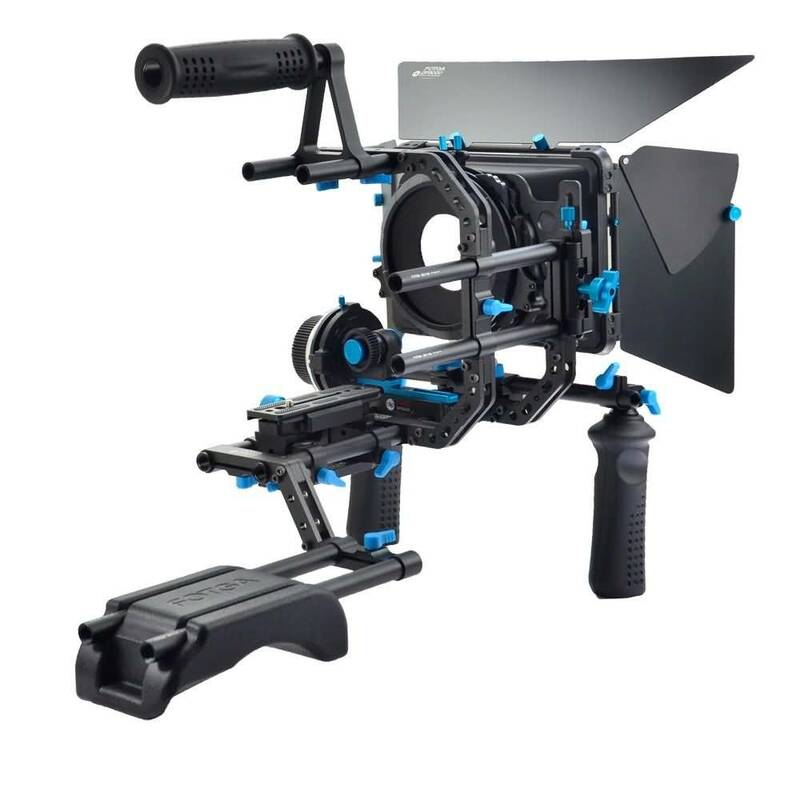 This camera rig ensures highly balanced performance even while allowing easy placement for several accessories. Suitable or reasonable price range. You will find it difficult to make adjustments for camera plate by nut tightening; it is better to work with quick release plate. Its large L angle consumes lots of space in your bag. 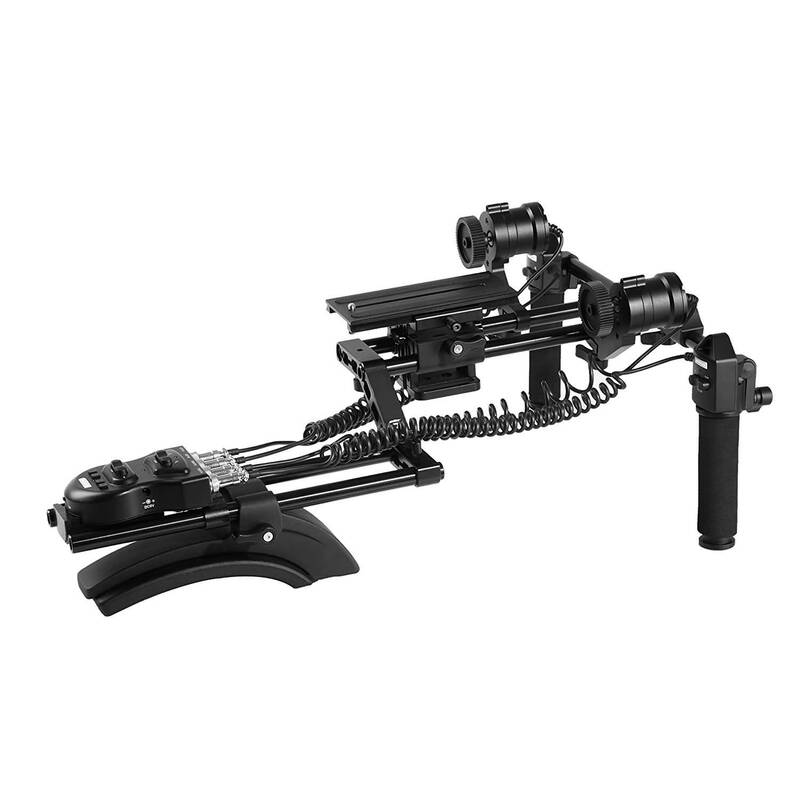 This premium motorized type shoulder rig offers compatibility with almost all popular camera lens types. It is best selection for professional shooting needs; however, its low price makes it suitable for beginners too. Movo MFF400 is designed with durable motors, zoom memory and assists in smoother photography results. You will find easy controls for speed settings as these switches are located on handles. This battery power rig also allow users to enjoy easy focus on objects with adjustable speed limits. Best choice for beginners as well as professionals. This rig works perfectly with all popular lens types. It is designed with focus and zoom programmable control switches. You will find it much easier to configure. This durable rig is well known for its classic performance with delivery of highly balanced shots. You will find it comfortable to handle and the offers multiple mounting options for enhanced results. The shoulder pads are well designed with soft grip handles that allows users to work for hours without finding any difficulty in handling their heavy weighted shooting devices. You can expect precise focus with its follow focus design. 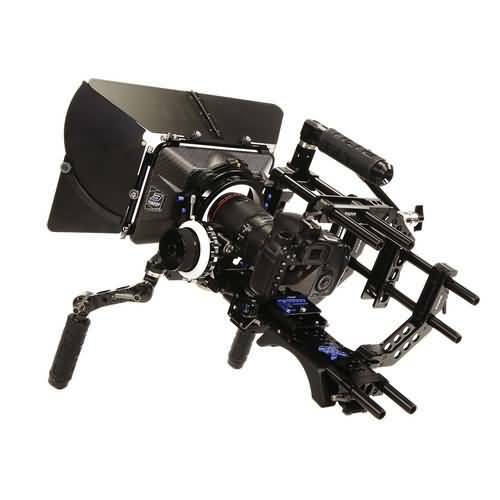 This rig is designed to offer wide range of features even at a reasonable price range. It offers compatibility with all popular HDV, DV, camcorders and DSLR cameras. The soft padded design makes it more comfortable so that professionals can work tirelessly for hours. 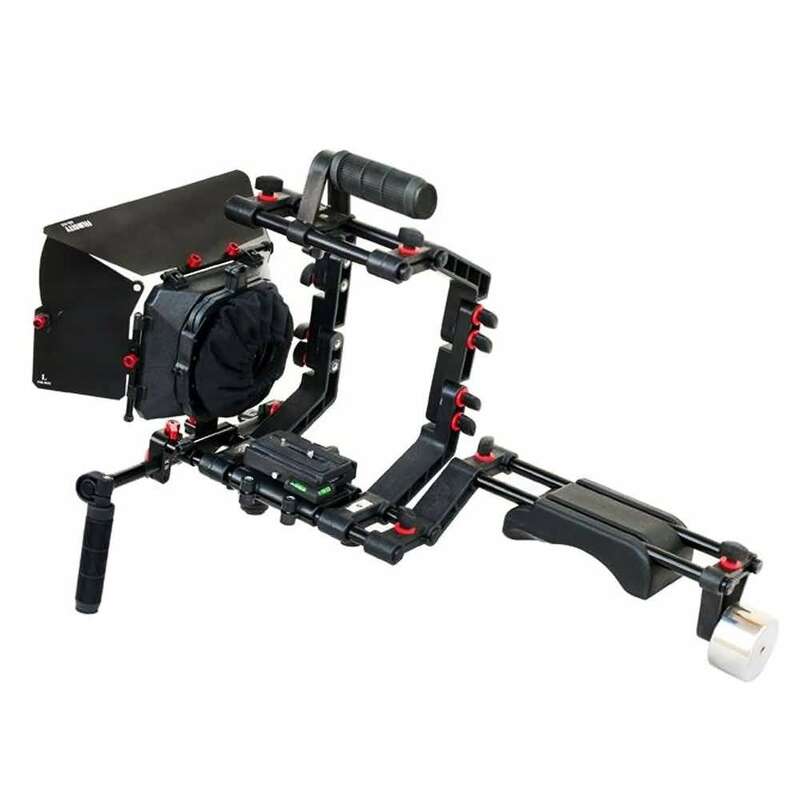 Filmcity DSLR Support Rig is capable enough to maintain smooth shooting experience while minimizing vibrations and shakes. The multiple mounting points allow users to adjust it up to suitable height with proper angle and direction adjustment. It is light in weight due to plastic construction. Easy to carry for field recording needs. It can work with multiple lens dimensions; maximum range goes up to 95mm diameter. This rig can be easily attached to tripod. Here is one more low cost solution for your shooting needs with wide stability and smooth operation. 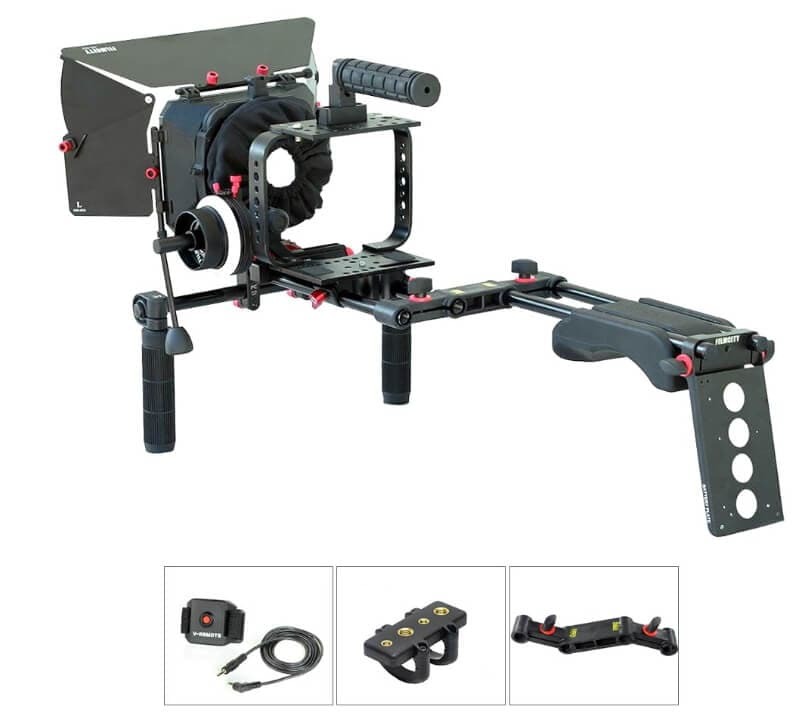 It is designed with stabilization system, matte box and rail-rods having 15mm size. The high quality design makes them more durable and the lined shoulder pads increase comfort. You can easily connect this rig to 20 universal base mounts. You will be able to get 2 year manufacturer warranty with this rig. Best for beginners as it falls in most affordable range. Great design with durable and sturdy build due to metal construction. Barn doors are designed using good quality plastic material. It is much easier to stabilize, can maintain balance in tough shooting locations. Nuts never get locked perfectly due to highly leveraged handles. You will not find any guide to learn about its usage. This durable rig is designed using stainless steel and aluminium material; you can enjoy easy higher and angle adjustments with this shooting accessory. 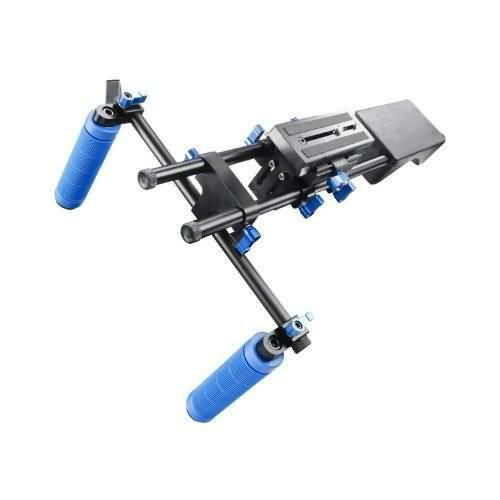 Morros DSLR rig is well known for its comfortable design and flexible material grip and the assembly as well as storage task is also much easier. You will find them easier to install. Assembly task is much simpler. 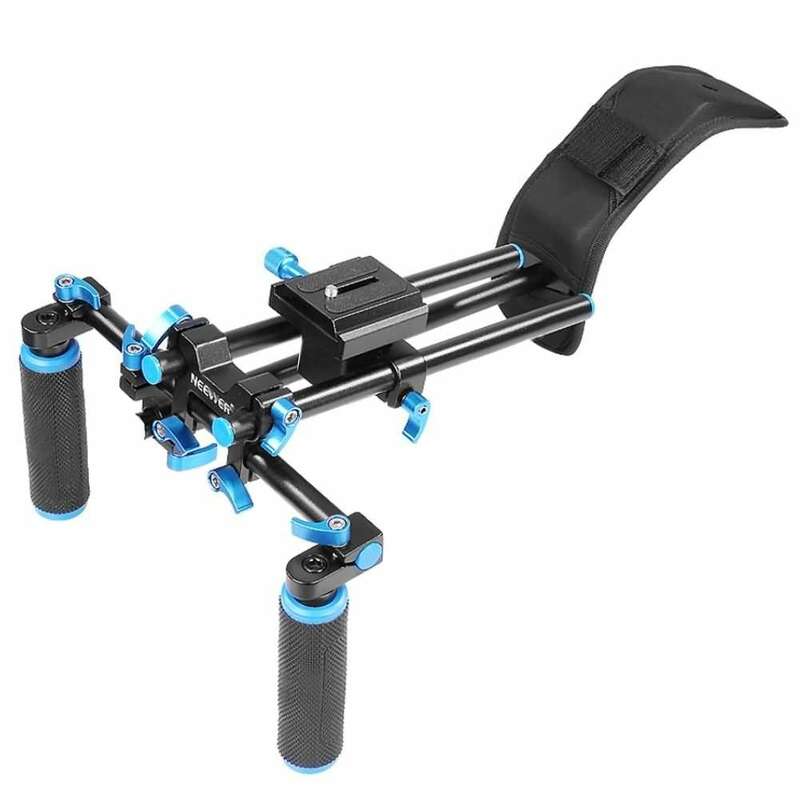 This DSLR Rig is available with one year warranty. They are shipped from US with too much shipping time. It does not come with standard screw mounts. Here you have a super lightweight choice for your field recording needs and it fits your budget too. It makes shooting task much easier for beginners and the high quality material ensures comfortable handling. Portable and highly flexible design. Perfect choice for field as well as studio photography. The rail-rod sliders help in easy adjustment of focus and zoom. People find its setup little complicated. Shoulder pads are observed to be thin that cannot handle weight properly. It is light in weight so you can enjoy hour long recording with this rig. Film creator find it the most budget and application friendly choice. It can be folded so you need lesser space in your bag to pack it. Designed with sturdy material to offer long life performance. You will get best value for money. It offers impressive stability and support at a minimal price range. The performance gets automatically improved with its follow focus technology and the rugged design make it suitable for field applications. Solid as well as rugged design. Easy to handle with comfortable hold. Grips are not able to ensure perfect security. Finally, you must have collected enough details about all top ranked DSLR rigs and hopefully they are suitable to your applications. But in case if you are still confused about making final decision then you can update your questions, we are here to provide you all valuable details as per your need. If you have selected your rig from the list then order it soon and start enjoying great recording hours. But never forget to share your experience with other friends on this network. Stay in touch with our Facebook page to avail routine updates about useful content.